On Thursday, April 18 at 7:00 pm in Cleveland State University’s Drinko Recital Hall, pianist Angelin Chang, soprano Patrice Michaels, and classical music producer James Ginsburg will present Michaels’ THE LONG VIEW: A Portrait of Ruth Bader Ginsburg in Nine Songs. The cycle serves as the centerpiece of this one-act, 75-minute dramatic concert which also includes works by Vivian Fung, Stacy Garrop, Lee Hoiby, Lori Laitman, and John Musto as well as projection designs by Yee Eun Nam. A Question & Answer session will follow the performance. Admission is free and open to the public. This nine-song cycle by Michaels (daughter-in-law of RBG) brings to light many aspects of Justice Ginsburg’s personal and professional life through letters, remembrances, conversations, and court opinions. The cycle has been recorded by Michaels for Cedille Records, the Chicago-based label of James Ginsburg (son of RBG). 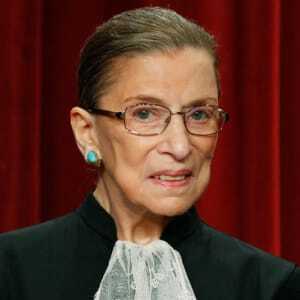 The album Notorious RBG in Song is available from Cedille.